Húsgagnalína úr Íslenskum við verður frumsýnd í Ásmundarsal á HönnunarMars og samhliða verður gefin út samnefnd bók; Skógarnytjar. Verkefnið leggur grunn að nýrri viðarmenningu; sem stuðlar að sjálfbærri nýtingu nýrrar auðlindar, og miðlar upplýsingum um framtíðar möguleika. Skógarnytjar byggir á tveggja ára rannsóknar og þróunarvinnu unnin í samstarfi við alla helstu aðila í skógrækt á Íslandi. Kynnt verður til sögunnar húsgagnalína unnin úr íslenskum við, sem brúar bil á milli skógræktar og annars iðnaðar á landsvísu. Samnefnd bók, Skógarnytjar, leggur grunn að nýrri viðarmenningu; sem stuðlar að sjálfbærri nýtingu nýrrar auðlindar, og miðlar upplýsingum um framtíðar möguleika. With the first Icelandic furniture line in years Skógarnytjar proves the multiple possibilities that lays at the feet of the Icelandic forestry community. A publication of the same-titled book puts the concept in context with other Icelandic resources that can benefit society in multiple ways. Skógarnytjar builds on top of a two year research and development in collaboration with the Icelandic forestry sector. 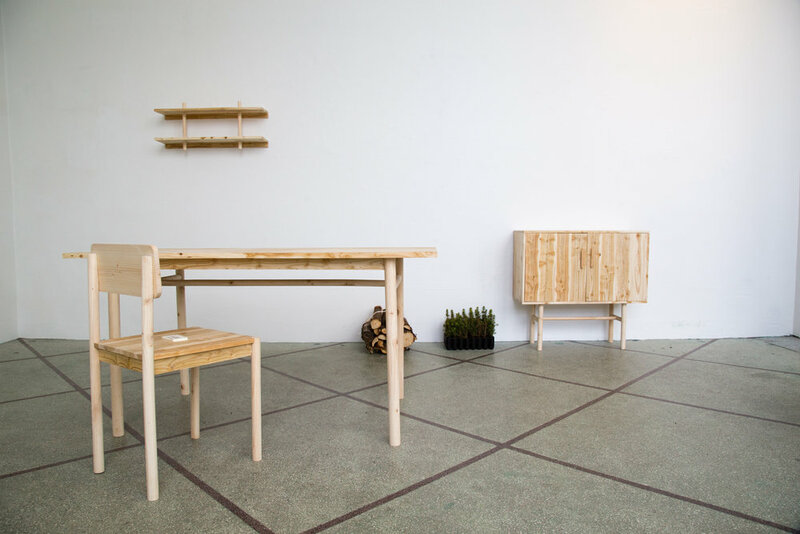 A furniture line produced from Icelandic wood will be premiered, designed with the needs of local industries in mind. A book of the same title, Skógarnytjar, lays a foundation for a new culture around Icelandic wood; that contributes to sustainable use of a new resource, and mediated information about future possibilities. Vöruhönnuðirnir Birta Rós Brynjólfsdóttir og Hrefna Sigurðardóttir eru tvíeykið á bakvið hönnunarstúdíóið Fléttu. Á HönnunarMars munu þær sýna afraskstur nýjasta verkefnis þeirra, Trophy, þar sem verðlaunagripir eru settir í öndvegi, þeir afbyggðir og séðir í nýju samhengi. Með verkefninu eru þær að skoða sögurnar, tilfinningarnar sem búa að baki verðlaunagripa, augnablikin og sigrana. The design studio Flétta will exhibit the project, Trophy, during DesignMarch where old trophies have been reused to make unique objects. Trophies are a part of big moments in people's lives, achievements and memories. They tell a story of countless hours and strenuous exercises. They live for the moment, when they are lifted up in triumph. Sigurrós Guðbjörg Björnsdóttir og Gudrun Eriksen Havsteen-Mikkelsen sýna handgerða leirvasa í kaffihúsinu í samstarfi við blómastúdíóið Pastel. Þær leyfa hráefninu að ráða för og lofa óvenjulegri og litríkri útkomu. Hver og einn vasi og blómvöndur er einstakur og engir tveir eru eins. Misfellurnar eru ekki faldar heldur er þeim leyft að njóta sín. Leir er hráefni sem auðvelt er að móta en hefur engu að síður sinn sjálfstæða vilja og er efninu leyft að njóta sín og taka okkur í óvæntar áttir. Vasarnir eru flestir með fleiri en eitt op fyrir blómin sem gefur þeim svolítið einkennandi útlit þar sem blómin dreifast út um allar áttir, og minnir óneitanlega á hollenska túlípanavasann sem fyrst var búin til á 17.öld, hannaður sem skrautmunur fyrir blóm. Pastel blómastúdíó framleiðir blómvendi og innsetningar úr afskornum, þurrkuðum og ferskum blómum. Pastel sækir innblástur í náttúruna, þar sem blómin eru ekki heft í fyrirfram ákveðnu formi blómvandar heldur fylgja sínum eigin reglum. Sigurrós Björnsdottir and Gudrun Havsteen-Mikkelsen will display handmade clay vases in the café, in collaboration with the flower studio Pastel who will make flower installations in the vases. Each handcrafted vase and flower bouquet is unique and rather than hide any natural imperfections, we let them be. Clay is a material that is easy to shape but often has its own will and we wanted to let the material be free to take us in unexpected directions. Most of the vases have more that one hole for the flowers which gives them a distinct character. The flowers spread out in all directions which undeniably reminds us of the Dutch tulip vase, designed in the 17th century as an ornament for flowers. Pastel Flower studio puts together bouquets and installations of cut, dried and fresh flowers. Pastel seeks their inspiration from nature, where the flowers are not firmly fixed in a certain shape of a bouquet but follow their own rules. 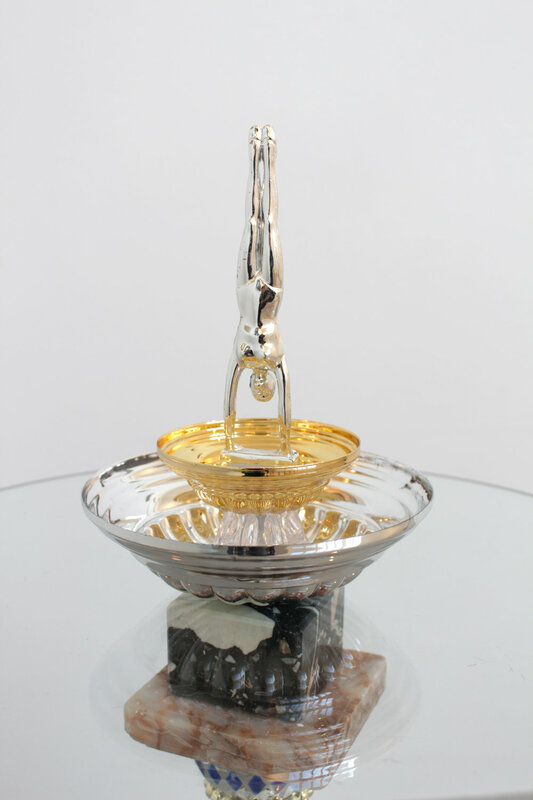 The natural form is then worked with, and converted into unexpected combinations.